Aeroline coaches are truly executive coaches with our cabin crew on board to serve meals,hot drinks, blankets and pillows. You can truly relax in our modern coach that offers on board entertainment via our touchscreen pad that serves you the latest selection of movies, music and games. AEROLINE offers these comprehensive service and it is little wonder why millions of passengers have loved travelling with us. 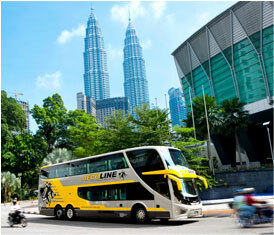 AEROLINE coaches are built on high quality imported Scania (Sweden)chassis. AEROLINE operates its very own dedicated maintanance facility that is manned by experienced mechanics to maintain the coaches to our own standards, by using only quality parts. Discover More about AEROLINE Coach Features HERE!